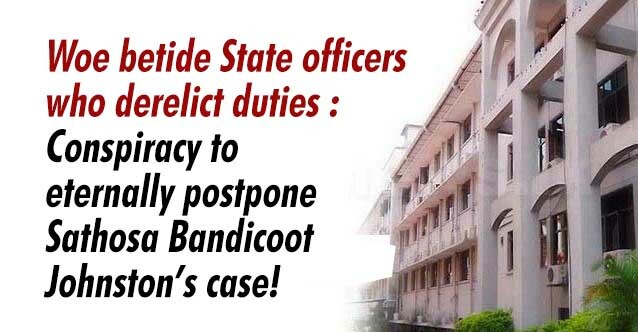 LEN - www.lankaenews.com | Woe betide State officers who derelict duties : Conspiracy to eternally postpone Sathosa Bandicoot Johnston’s case! (Lanka e News -31.Aug.2018, 7.00PM) The case against former minister Johnston Fernando based on charges of robbing the Sathosa is to begin at the Kurunegala high court on 2018-09-03 . However , it is learnt conspiracies are under way to keep on postponing this case unduly, deceitfully and unlawfully , according to reports reaching Lanka e news. This conspiracy is based on a novel method. That is a state counsel (her name is known to us but shall not reveal it right now) who is prosecuting is to feign sickness and arrange postponement of the case. Previously the defendants had been regularly postponing this case , and owing to that the Kurunegala high court judge began hearing the case continuously after remanding the accused .Hence in the circumstances , Sathosa bandicoot Johnston’s fate is written on the wall. According to inside information sources , with a view to delay the case and avert Johnston’s inevitable fate – going behind bars , this calculated deceitful maneuver has been designed . The lady state counsel who is a party to this is to be reciprocated by elevating her to the post of an appeal court judge after a Mahinda Government comes into power. The antecedence of this state counsel who had lately been travelling abroad very frequently is not very savory , based on reports reaching Lanka e News. At any rate as a news website which stands by truth and nothing but the truth, it deems it is its duty to remind these male and female counsels of one salient fact : the time has arrived for the public to teach a bitter lesson to such villainous government employees irrespective of their status and rank. The case in point was the justifiable fierce assault launched on the railways drivers and the station masters at the Fort by the public . Again the ruthless doctor villains too had to face an almost similar experience at Galaha . We cannot predict when the reaction of the provoked public will be triggered against the lawyers . At any rate we feel sorry that we are unable to make a prediction right now on how soon this people’s fury will turn against the crooked lawyers ,for us to give these scoundrels a prior warning in their own interests.